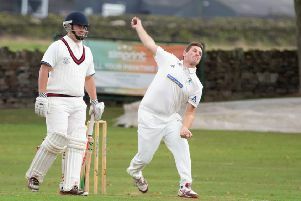 Walsden bounced back from Saturday’s Worsley Cup defeat at Darwen - their first loss of the season - to make it six wins out of six in the Lancashire League yesterday. They were seven-wicket winners at Enfield but were again frustrated by opponents seemingly intent on batting out their overs rather than adding runs top increase their chances of winning. That cost them the chance of two bonus points and leaves then four points behind next weekend’s visitors Ramsbottom at the summit. Enfield totalled 184-8 with their pro Shash Pussegolla making a patient 78. His Walsden counterpart and fellow Sri Lankan Umesh Karunaratne took 4-42. Jake Hooson typically anchored Walsden’s reply with 67 not out and skipper Nick Barker hit 47 before Karunaratne helped complete victory in the 44th over with an unbeaten 40. There was a somewhat bizarre finish. With five runs required, Karunaratne was sent back by Hooson and should have been run out but the throw went way over the keeper’s head for four. The visiting pro then smashed the next delivery, a no ball, out of the ground for six. Todmorden lost at home to a Rochdale side they had beaten away in the Worsley Cup 24 hours earlier. Openers Ben Pearson (39) and promoted skipper Andrew Sutcliffe (37) put on 72 to pave the way for a score of 237-6. Professional Chris Schofield hit 10 fours and two sixes in a knock of 76 and Bilal Abbas made 51 from 45 balls. Mo Bux struck three times against his former club to leave Rochdale up against it at 86-4 but an unbroken fifth wicket stand of 152 carried the visitors to victory. South African professional Ed Moore hit 102 off 96 balls and skipper Michael Harling provided excellent support with 64. It was a fourth defeat in six outings for Tod, who face a tough trip to Accrington next weekend.